Year in and year out, the Philippines falls victim to natural disasters as the country is surrounded by water, and falls along the Pacific Ocean’s “Ring of Fire”. The country is unlikely to be spared from the devastating typhoons that hit other parts of Southeast Asia. Earthquakes and super typhoons often results to high casualties, and property damage that affect the lives of a large number of people. Destroyed communities left behind by storms, affect the lives of children as well because their schools get devastated too. In order to help the children return back to a state of normalcy, Philam Foundation heeded the call of the Department of Education to rebuild classrooms in disaster affected communities. After Typhoon Juan and Sendong devastated the country in 2011, Philam Foundation committed to build sixty-five classrooms within five years in order to help meet the country’s classroom backlog. The first eight Philam Paaralan classrooms were built in Isabela, with additional six more in Cagayan de Oro and Iligan City. Philam Foundation President Max Ventura called the project timely. 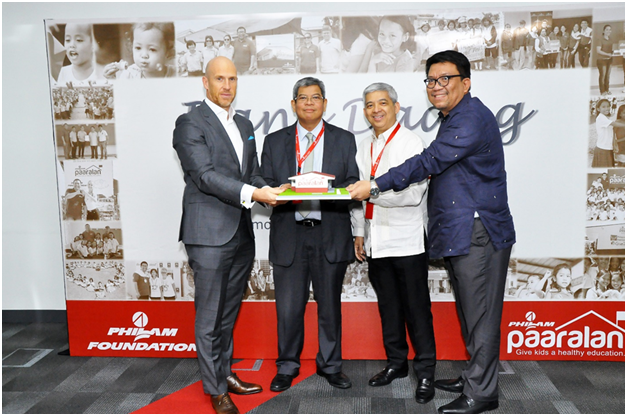 It was during Philam Life’s 65th year, that the Foundation decided to focus on empowering the Filipino children through healthy education as their primary thrust. “Building in the aftermath of Typhoon Sendong, Pablo and Yolanda, or Typhoon Haiyan as it was internationally called, only highlighted what Philam Paaralan is all about: giving children a healthy education and building communities,” said Ventura. With more than enough time before their deadline, Philam Foundation has gone beyond its original commitment, having successfully constructing eighty-five classrooms in the past three years. Each Philam Paaralan is typhoon-resilient, and built with complete facilities: desks, tiled flooring, blackboards, electric fans, and lighting fixtures. As part of their vision to give each child a healthy education, each classroom is also fitted with Water Sanitation and Hygiene (WASH) stations, to promote a healthy and clean lifestyle. Philam forged partnerships with the best local organizations, who have the vision and drive to create change. “We could not have accomplished this feat without our many project partners, the Department of Education, as well as the local governments where we built our classrooms,” said Ventura. “Thanks to these gracious organizations and people, we were able to not only build classrooms, but also hope,” he concluded. According to Ventura, Philam Paaralan is more than the sum of its parts, more than the funds raised, and more than the number of classrooms built. “It is about the lives it has touched, the communities it has revived, and the children it has nurtured,” he said. Even after achieving remarkable results, they have yet to show signs of slowing down. Philam Foundation commits that their 100th classroom will be completed by July of 2016. Considering that each classroom is able to hold about fifty students, a total of 5,000 children will immediately benefit from this project. Since future generations will also utilize the structures, the number of lives touched by these buildings becomes multiplied tenfold. Visit www.philamlife.com for more information on Philam Foundation.